The alliteration of this blog title signals part of the two big moments from this week: On Friday, July 11, Bertram took his first steps without assistance from either of his parental units. Oh sure, he cruised, holding on to furniture, or our legs; he toddled along holding our hands. But now, he pushes away the comforts of our steady hands in favor of his own Frankenstein-like lurch walk. Bertram spreads his arms out wide and in front of his body as he takes each step. He also enjoys holding on to his own stroller for support as we push it and our walking boddler ever so sloooowly down the street. I hope to post walking video footage soon. On Thursday, a convoy of stroller toting comrades and I made the pilgrimage to Long Beach. Out-of-towners may not appreciate the complexity of undertaking such a journey on public transport. 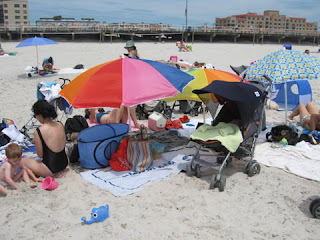 We had six moms, seven babies and a lot of stuff--three umbrellas, food, water, six strollers (including Young Master Bertram's royal "coach," the 18 lb. 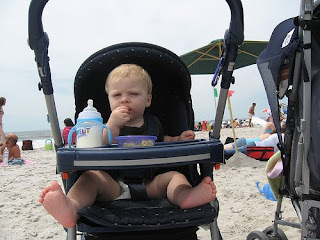 Peg Perego Venezia), two Ergo carriers, a bjorn, two hot slings, beach toys, blankets, and two baby beach pods. So imagine all six of us hoisting our babies and stuff up and down platform stairs, into trains, and then hauling everything over the sand, until finally, we reached "Polar Bear" beach. Of course, on the train out to Long Beach, we met a random mom and babe team who were venturing out from Astoria to go to the beach solo for the first time. Let's hear it for this young, intrepid mom! I also have to mention that this lil' guest chubster had such a cute nickname. His momma called him, "Pocket." Needless to say, we grew into a beach party of seven moms and eight babies. The water was cold, the sand got everywhere--in babies' mouths, under the diapers, in the fingers, you name it. The walking toddler and boddlers among us climbed up "lifeguard mountain," a great mound of sound where the young lifeguard sat perched in his wooden chair, blowing his whistle and telling swimmers to stay between the flags. The pre-walking boddlers enjoyed tasting sand and playing with (or chewing on) plastic sea creatures, pails, and shovels. The babies were so excited by the sand and surf! None of the babies wanted to nap and the mighty Ergo had to be employed to help wind down the boddlers to their afternoon slumbers. 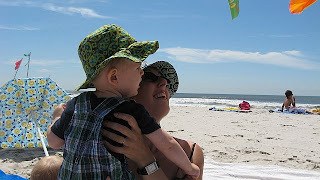 The eldest and therefore, most verbal child -- about 2 and 1/2 years -- in our group had his first city beach experience. Though he was shivering from a dip in the cold, cold ocean, he kept urging his mother to take him back, blue lips and all, to the waves. I can relate to my young beach companion. For my favorite thing to at the beach is to swim and be tossed about in the water. And, for 1o blissful minutes while Bertram was napping, a few of us moms ran into the icy froth for frolicking merriment. We yelled and yipped like we had never been to the ocean in our lives. I do believe that an exhaustive and fun time was had by all.